Girl Scouts of the USA is kicking off Volunteer Appreciation Week by thanking all of our volunteers for volunteering for girls. Without a paycheck and without any fanfare, Girl Scout volunteers devote themselves to girl leadership. They put in long hours, stay patient as girls lead their own activities, and bring fun and spirit to everything girls do. Girl Scout volunteers are making a difference in the world, one girl at a time. 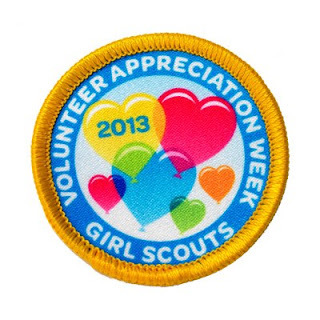 Volunteer Appreciation Week is set aside especially for volunteers. Girl Scouts pay tribute to the volunteers who help girls make the world a better place.